Mix flours on a piece of parchment and set aside. Heat water, butter and salt to a boil and butter is incorporated into the liquid. Gather the ends of the parchment to form a funnel. Pour the flour into the liquid, using a wooden spoon to mix as you pour. Pour as fast as it can be absorbed in the liquid. Do not pour it all at once or it will be a lumpy paste. Cook the mixture and stir constantly. If there are lumps, press the against the side of the pan with the back of the spoon. When the entire mixture is in one mass, about 2-3 minutes, remove from heat. Turn the paste into a mixing bowl and allow to cool briefly. You want to avoid cooking the eggs as you add them! With the paddle attachment on medium low, add the eggs 2 at a time. Spread the paste into three circles about 1/2” thick on three circles and use a pastry bag and large round tip to pipe the pastry into one circle (for top). Bake at 375° about 40 minutes or until the pate a choux is completely baked. Turn off oven; prick the dough and leave in oven for three to five additional minutes to insure dough is dry. While the choux is baking, complete steps 1-2 below. Then begin preparing the strawberry compote cream. Stem and cut the strawberries into chunks. In a medium saucepan, add the berries, sugar and lime juice and stirring constantly, bring to a boil. Remove from heat and pour into a bowl. Chill. To soften the gelatin, sprinkle it over the water and allow it to sit. Then heat it gently to dissolve it. Warm ½ c (120 ml) of the heavy cream, but make sure it isn’t hot. Pour the remaining heavy cream into the bowl of a mixer and begin whipping the cream. Combine the warm cream with the gelatin mixture. Then, slowly add the gelatin cream mixture and continue to whip to soft peaks. Fold in the chilled berry compote and immediately assemble the cake layers. Place one thoroughly cooled choux circle inside the bottom of a springform pan, right side facing up, that is resting on a plate or cake circle. Slice the vanilla bean along its length and using a spoon, scrape all the seeds into the granulated sugar. Mix thoroughly. Save the seed pods for another use. Pour the cream into a chilled mixing bowl and with a chilled whip, beat at high speed. Add the sugar vanilla bean mixture. Once the cake filling is thoroughly set, remove from the refrigerator. Run a knife around the inside perimeter to loosen, then remove them. 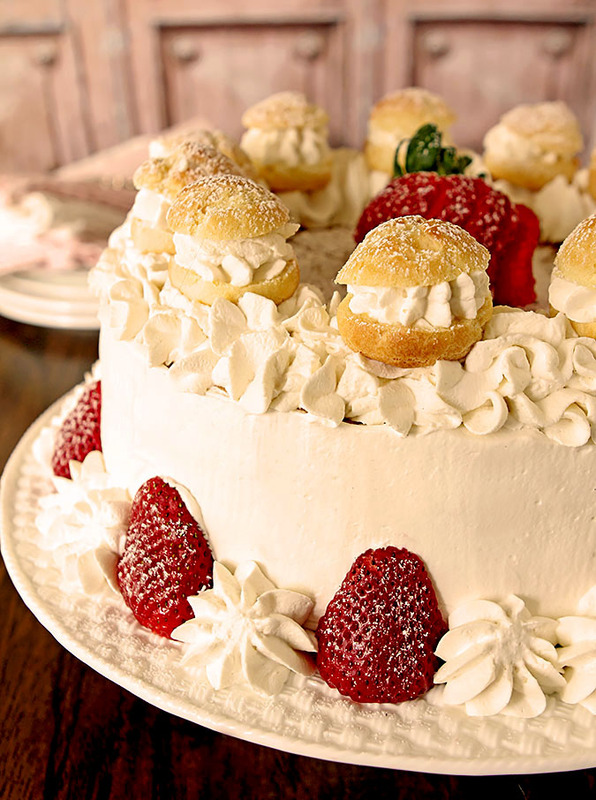 Ice the sides of the cake with the Chantilly cream and press the scraps into the Chantilly cream if using. Dust with powdered sugar on top. Finish with a decoration of halved strawberries around the bottom and some with stems on top. I suggest making the choux pastry pieces the day before and finishing the next day with the filling, the Chantilly cream and the decorations. This is a fun project but takes some time and splitting it into two days worked well for me. Cover the baked choux if keeping it overnight. © 2017 Creative Culinary. All rights reserved.